Hearing that marijuana dispensaries are still being targeted by federal raids in 2018 is disheartening, but when the police officers who are enforcing the raids use the drugs themselves, it reeks even more of corruption. That is what two Toronto police officers have been charged for after they allegedly consumed cannabis-infused chocolate that was seized as evidence during a dispensary raid. Ironically, the two officers who ate the marijuana ended up having to call 911 and have paramedics rush them to the hospital when they began to panic. Hearing documents revealed that as a result of the officers' alleged criminal actions, charges were dropped against the seven dispensary workers who were arrested in the raid where the officers got the consumable marijuana. The two officers who ate the marijuana are Vittorio Dominelli, 36, and Jamie Young, 35. Dominelli has been charged with four misconduct charges including discreditable conduct and being unfit for duty due to consumption of drugs. Young also faces the same misconduct charges plus two more, one for neglecting to carry out a lawful order and knowingly making a false statement. Both officers were previously charged with one count of criminal breach of trust and attempting to obstruct justice in addition to the internal disciplinary charges. 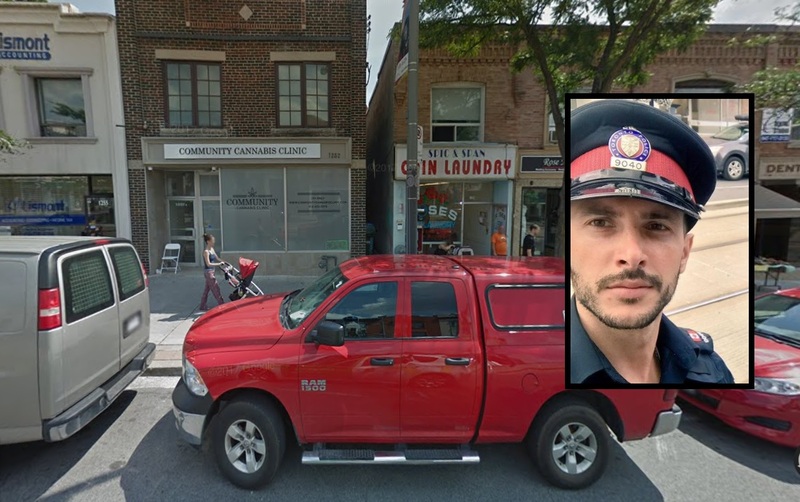 The hearing documents also revealed that both officers were working in plain clothes January 27 when they were involved in the execution of a search warrant at Community Cannabis Clinic on St. Clair Ave W. Young was responsible for seizing the property within the dispensary while Dominelli was responsible for arresting, charging, and subsequently releasing seven people who were in the clinic at the time of the raid. The documents say Young "failed to account for some of this chocolate seized at this search warrant." They also allege, "The quantity listed on the property tag and submitted did not match the true amount seized… In so doing, you committed misconduct in that you knowingly made or signed a false statement in a record." A few hours after the raid, the officers "consumed some of the chocolate containing cannabis oil." Two hours after that, both officers called in to say they needed help after feeling like they were going to pass out. Dominelli’s lawyer Peter Brauti said his client is "obviously very embarrassed in relation to the allegations." Brauti added, "Immediately after the incident occurred, we attempted to address the situation with the Toronto Police Service." If the officers are found guilty, they face anything from formal reprimand and dismissal to jail time. The incident has only added to tensions between dispensaries and police in Toronto communities.